Hasbro has unleashed its lawyers on a blogger it claims to love. Martyn Yang of Canberra runs the Urban Taggers: Apartment Warfare blog, a site dedicated to "all things to do with toy blasters," which of course includes Hasbro's extensive line of Nerf guns. So when he received an email from Leigh Gibson, Hasbro's Pacific product manager, offering to supply some Nerf Pinpoint Sights for a promotional giveaway, he was pretty excited. Gibson offered ten of the not-yet-for-sale items to give away to users, plus one for Yang himself - but they never actually arrived. Instead, six days after giving Hasbro his mailing address, he received a letter from the Baker & McKenzie law firm demanding the removal of "commercially sensitive information and copyright protected images about its unreleased N-Strike Elite 'Rampage' Blaster" and, more disconcertingly, the name, address, email and IP address of whoever supplied him with the images and information. Yang, to his credit, refused to roll over. He pulled the images from his site but refused to name the source, suggesting instead that someone at Hasbro check out eBay, the Chinese equivalent Taobao, or perhaps do a little Googling to dig up the information itself. In response, Baker & McKenzie lawyer Robert Arnold told Yang that Hasbro "has real concerns about [his] ability to access Nerf products before they are released to the market" and expressed hope that he'd reconsider and discuss the matter further. He also claimed that Hasbro's request for his mailing address had nothing to do with his letter. "I can only assume that Hasbro really does want to send you some stuff. Hasbro actually admires what you are doing with your blogsite and has no wish to shut you down," Arnold wrote. "But you must understand that Hasbro has got to find out where these samples came from." But three weeks after that, the situation went downhill even further when Yang's neighbors told him that a couple of "creepy people" had been hanging around his apartment. They turned out to be "representatives" of Baker & McKenzie, possibly private investigators hired by the firm, and they wanted to talk to him. Yang, "taken aback [and] shocked by the ambushing," agreed, but then fired off another lengthy letter to Arnold reiterating his position. He also forwarded a breakdown of the entire exchange to the Office of the New South Wales Legal Services Commissioner. "I was very, very disappointed with Hasbro... People are often surprised that my blog is all done for free and for the geeky love of Nerf," Yang told Crikey. 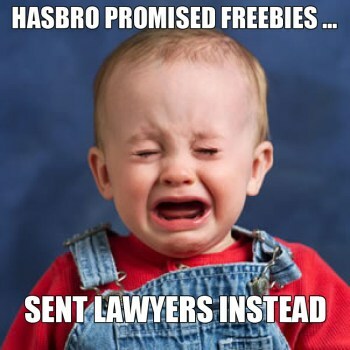 "As a consumer and long-time fan, I felt that the far from up-front emails from Hasbro and their lawyers were very poor behavior from such a large and sophisticated organization." Representatives of Baker & McKenzie refused to comment on the matter, while Gibson hung up on Crikey when asked whether Hasbro had pulled the ol' switcheroo on Yang to get his address.